YOUR SUBCONSCIOUS MIND HOLDS THE KEY TO INCREASING YOUR FERTILITY! Dr. Steve G. Jones M.Ed. takes you to the next level, gives you alternatives when everything else doesn't work, and improves your chances of finally getting pregnant!!! Hypnosis has given birth to new hope for infertile couples. In 1995 there were 2.1 million married couples who sought help conceiving through various methods. This represented 7.1 percent of the population, many of which are now parents after having turned to hypnosis for help. These couples have found that the odds of conceiving through currently available medical interventions are greatly increased when they put mind over matter. There are many incidences where infertile couples (defined as those who have tried unsuccessfully to conceive for at least a year) finally have a baby or adopt just to find out they were expecting another baby without really “trying.” This is usually attributed to the fact that once they have one baby the couple, and especially the mother, is able to relax. Hypnosis brings upon that level of relaxation about conception before the first child enters the family. Recent scientific studies have confirmed that hypnosis aids infertile couples in conceiving. The normal rate of conception is about 20 percent with in-vitro fertilization. When hypnosis is added to the mix, that rate jumps to between 42 and 55 percent. Dr. Steve G. Jones M.Ed., a board certified clinical hypnotherapist, has created a hypnosis program whereby women are able to reach a state of relaxation that prepares the mind and body both for conception. 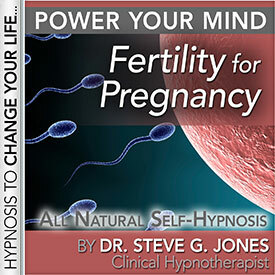 “Increase Fertility” is a self hypnosis program that is used daily for a few weeks. After that time an overall level of relaxation and new mindset about fertility can be achieved and carried into the daily thought processes regarding conception and parenthood.